Hope's Cafe: Cleanlogic Body Care Review! I love reviewing bath and body care products, and recently I had the opportunity to review a really nice body wash and lotion set from Cleanlogic Body Care. 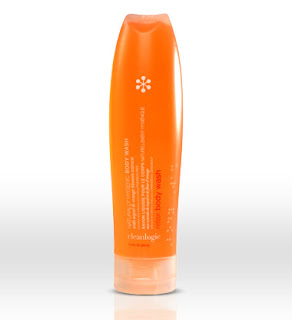 "Cleanlogic's body care line leaves your skin feeling clean, smooth and nourished. Its formulas are enriched with Nopal cactus extract, known for its soothing properties, and natural extracts to moisturize and help rejuvenate skin." I was sent the Relax (with nopal and orange blossom extracts) body wash and lotion. They smell sooo good! A very fresh, clean, orangey scent! I have used this set every day since I got it in. The body wash lathers up very nicely, and the lotion really helps with moisturizing throughout the day. "Only in the last 20 years has modern science illuminated the remarkable properties that exist in the Nopal cactus extract – detoxifying and healing qualities that have helped provide skin solutions for over 1200 centuries. Now, cleanlogic brings you the first body wash infused with this remarkable natural extract – a beauty industry first! The anti-aging properties and rejuvenating benefits of Nopal are gently infused with orange blossom extracts to create a rich, aromatic lather that leaves your skin feeling clean, smooth and nourished. With regular use, cleanlogic’s relax body wash will help prevent wrinkles and cellulite to help keep your skin looking youthful and spa-fresh." 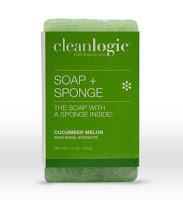 And check out this unique product Cleanlogic carries-a soap + sponge combo! I'd never seen something like this before, and it looks really neat! 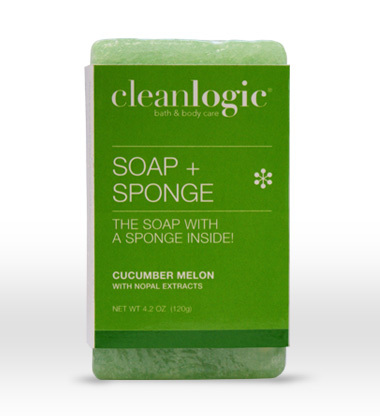 "Whether you are a bar soap lover or loofah-style sponge loyalist, our exclusive soap + sponge…an industry first…meets every need in one simple product! Moisturizing glycerin soap cleanses and balances the skin’s moisture needs just as the progressively-infused antimicrobial sponge gently exfoliates to reveal a body refreshed and naturally clean. By combining the important daily regimen of cleansing with the action of removing dead skin layers, cleanlogic has rewritten the rules on exfoliation! ‘Soapfoliate’ your skin in an exclusive and innovative new way!" Now, as I close this review, I'll leave you with a fun fact I learned on the Cleanlogic Body Care website. Did you know that globally, dead skin accounts for about a billion tons of dust in the atmosphere? Wow!